The whole content of the report is included. At the end of each of the 2 sessions, the discusions following the presentation of the papers is also reported. The session 1 was devoted to the presentation of rabbit production in 5 African countries (no abstract available). For the 13 papers presented during the 2nd session , each communication is followed by an abstract of the paper, in italic for those realized by the webmaster of this web site (FL), in order to facilitate the bibliographical indexation. Presentation of the different questions and answers which have followed the oral presentation of the different communications of this session. Owen J.E., 1978 - Rabbit production in tropical countries, Workshop on Rabbit Husbandry in Africa, Morogoro-Tanzania, December 16-21, 1978, 73-92. Abstract : Rabbits are making an increasing contribution to meat production in many developing countries in the tropics. These animals are capable of supplying meat in reasonable quantities when kept under small-scale low input systems. This paper draws attention to some of the advantages of the rabbit as a meat producer in tropical countries, and also to the problems which must inevitably arise. Although successful rabbit production is being achieved in many cases, notably in Ghana, there is considerable room for improvement without resorting to the use of expensive equipment and materials. Work needs to be carried out on many aspects of rabbit meat production in the tropics. The most important consideration is nutrition and feeding in relation to the efficient utilisation of locally available materials. The Tropical Products Institute in collaboration with Reading University. has initiated a research programme on this subject. Some data arising from this project is discussed. Much of the. information presented was collected during overseas visits by the author. Mamattha N., 1978 - Sociological aspects of introducing rabbits into farm practice , Workshop on Rabbit Husbandry in Africa, Morogoro-Tanzania, December 16-21, 1978, 93-99. 2. Aid to the back-yard and commercial breeders by way of cheap parent-stock, drugs and additives to make possible for more and more people in the slender income group to produce, through the breeding of rabbits, quick and rich protein-meat for their families - thus forcing down the cost of other meats they need to eat for variety and good health. McNitt J.I., 1978 - Methods of smallholder rabbit production, Workshop on Rabbit Husbandry in Africa, Morogoro-Tanzania, December 16-21, 1978, 100-111. Abstract : A number of problems which may impede rabbit production in developing countries are enumerated. The approach of the Bunda College Rabbit Research Project to the problems of housing and facilities, breeding, alternative feedstuffs and disease are described along with examples of possible solutions to each problem. It is concluded that smallholder rabbit production is possible in the Central Region of Malawi but further work must be carried out before widespread introductions are made. Costa O., 1978 - Rabbit production in developing countries, Workshop on Rabbit Husbandry in Africa, Morogoro-Tanzania, December 16-21, 1978, 113-116. Odonkor L., 1978 - A new method for rabbit production, Workshop on Rabbit Husbandry in Africa, Morogoro-Tanzania, December 16-21, 1978, 117-128. Ramchurn R., 1978 - New food resources for rabbit in Mauritius, Workshop on Rabbit Husbandry in Africa, Morogoro-Tanzania, December 16-21, 1978, 129-135. Abstract : The possibility of using Saccharum officinarum, Leucaena leucocephala, Stenotaphrum dimidiatum, Chloris gayana and Pennisetum purpureum was studied. In the first experiment all these species were compared with a prepared standard feed. There was no significant difference between the standard diet and Saccharum spp. and Stenotaphrum spp. Leucaena sp. proved to be better than the standard diet. In the second and third experiments with different levels of Saccharum sp. and Leucaena sp. results showed that the replacement of up to 40% of the standard diet in growing rabbits seems to be possible without affecting the performances of the animals. El Amin F.M., 1978. Reproductive performance of rabbits selected for post-weaning growth rate, Workshop on Rabbit Husbandry in Africa, Morogoro-Tanzania, December 16-21, 1978, 137-153. Litter size weaned 5.47 young/litter over all the lines and generations showed some improvement over the initial levels. It was also shown that inbreeding had little effect on litter traits indicating the success of the mating plan in avoiding inbreeding at the initial generations. There was a correlated response in age at first kindling to selection for rapid post-weaning growth rate. Aduma J.P., 1978 - Coccidiosis in rabbits, Workshop on Rabbit Husbandry in Africa, Morogoro-Tanzania, December 16-21, 1978, 155-161. 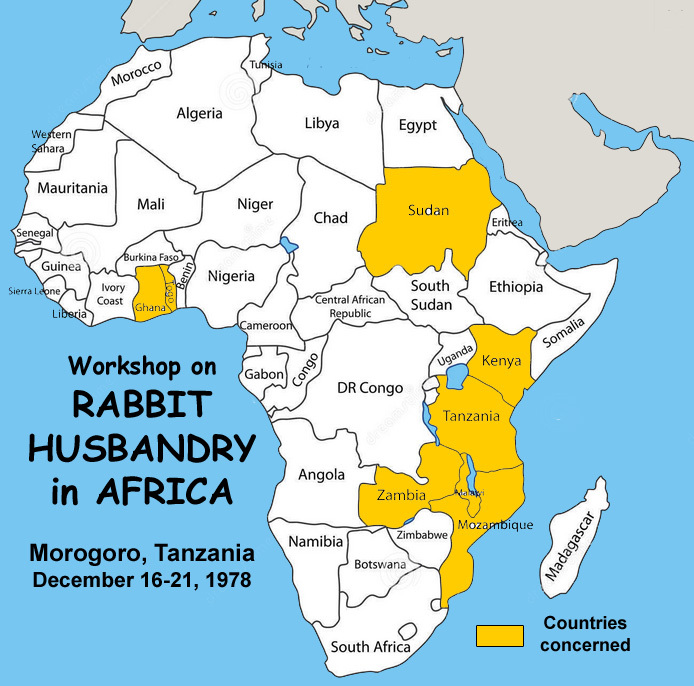 Semuguruka W.D., 1978 - Observations on rabbit diseases in Tanzania, Workshop on Rabbit Husbandry in Africa, Morogoro-Tanzania, December 16-21, 1978, 163-170. 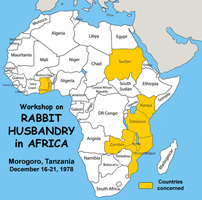 Rugh J.W., 1978 - Housing of rabbits in Africa, Workshop on Rabbit Husbandry in Africa, Morogoro-Tanzania, December 16-21, 1978, 171-179. Abstract : Rabbits are raised in a variety of conditions, including batteries of cages in a commercial rabbitry, backyard hutches made of boards and wire screen, cages made of bamboo, dirt floors in mud huts, and even in their natural habitat in the wild. In this paper the author reviews some of the different housing in which rabbits are raised and some of the basic criteria to keep in mind when designing housing for rabbits. Two types of housing appropriate to African village conditions are dealt with more specifically; the wood and bamboo hutch commonly used in forest areas; and alternatives for savannah areas where even these materials are difficult to obtain. Williams D., 1978 - Rabbit raising in Saboda area [Ghana], Workshop on Rabbit Husbandry in Africa, Morogoro-Tanzania, December 16-21, 1978, 179-183. Owen J.E. , 1978 - Notes on [rabbit] slaughter and carcass preparation, Workshop on Rabbit Husbandry in Africa, Morogoro-Tanzania, December 16-21, 1978, 203-206. Anonymous, 1978 - Recipes on cooking rabbits, Workshop on Rabbit Husbandry in Africa, Morogoro-Tanzania, December 16-21, 1978, 207-212.